SSK Sales Co., Ltd. was able to solve all their hot water supply problems by switching their conventional water heating tank to TLV's SteamAqua SQ6. Impressed with the resulting savings and increased efficiency, they now use SteamAqua in each of their three factories and are planning to install a fourth. 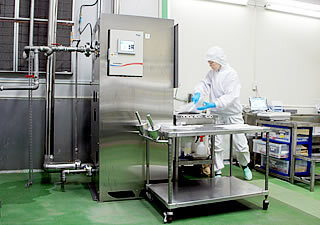 SSK Sales, a producer of soups, canned fruits, and candies, uses hot water both as an ingredient in their products and in the daily washing of all their equipment. At their Fukushima factory, the demand for hot water can vary from 3-4 tons to as much as 10 tons in one day. To meet these fluctuating demands, they previously relied on a large water heating tank housed inside the factory. In order to maintain the 80-90˚C temperatures needed to sterilize bacteria, the tank was heated with a constant supply of steam. This caused the surrounding work environment to become extremely hot and humid; especially during summer, the conditions were virtually unbearable. SSK Sales had essentially given up trying to find a solution when they were first introduced to TLV's SteamAqua. They were initially very skeptic, unable to believe that such a compact unit could deliver hot water instantaneously and consume steam only while in use. However, their curiosity and growing need for a solution lead them to purchase their first SteamAqua, if only to test it out and see for themselves if the claims were true! Switching to SteamAqua eliminated the excess humidity & heat which had plagued the factory workers for so long and reduced water & energy consumption. The compact design also helped save factory space. Since the SteamAqua's indirect heating method only consumes steam while in use, it does not cause the surrounding area to become hot. In SSK Sales' case, the elimination of radiant heat loss from the tank also lead to a decrease in utility costs, as the burden on the air conditioning system was reduced. Furthermore, for sanitary purposes, any leftover hot water must be disposed at the end of each day; however, since the SteamAqua produces hot water instantaneously and only in the quantity needed, there is no excess hot water left, and wasteful draining is therefore avoided. After using the SteamAqua, the factory workers were impressed by its speed and performance and were pleased to see their work environment improve drastically. 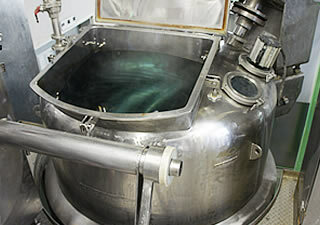 In addition to all the improvements mentioned above, the SteamAqua also helped ensure continuous production. Previously, when the hot water tank's supply had been exhausted, production was sometimes delayed until a new batch of water could be heated. The SteamAqua eliminated this bottleneck and ensured that production could continue smoothly with a constant hot water supply. Most of all, the SteamAqua brought peace of mind in its ability to offer a reliable and sanitary solution. As a food product manufacturer, sanitation always comes first and foremost, and equal attention must be given to ensure the quality of both the ingredients and the water used throughout production. Out of the many steam-fired water heaters available on the market, only TLV's SteamAqua was able to offer an indirect heating solution in compliance with all sanitation and water quality regulations. Though other makers offer direct-contact steam heating units, these products could not be used at SSK Sales for sanitary reasons. Following the positive results from the first SteamAqua, SSK Sales purchased two more units for their other factories in 2016. They are currently planning to install an additional unit and are happy to have found a product that provided a solution and exceeded all expectations.